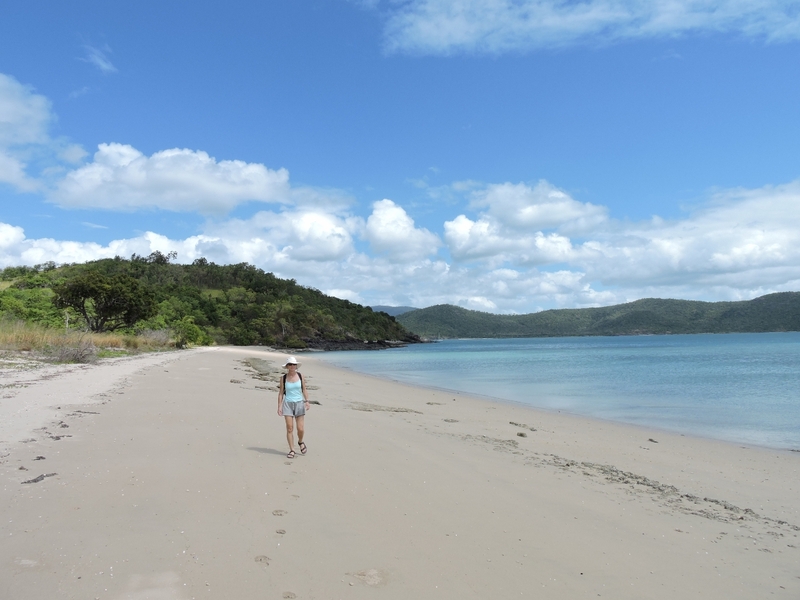 We ended our 1,532-mile run from Melbourne at Shaw Island in the Whitsundays. From there we slowed down and coastal-hopped north. 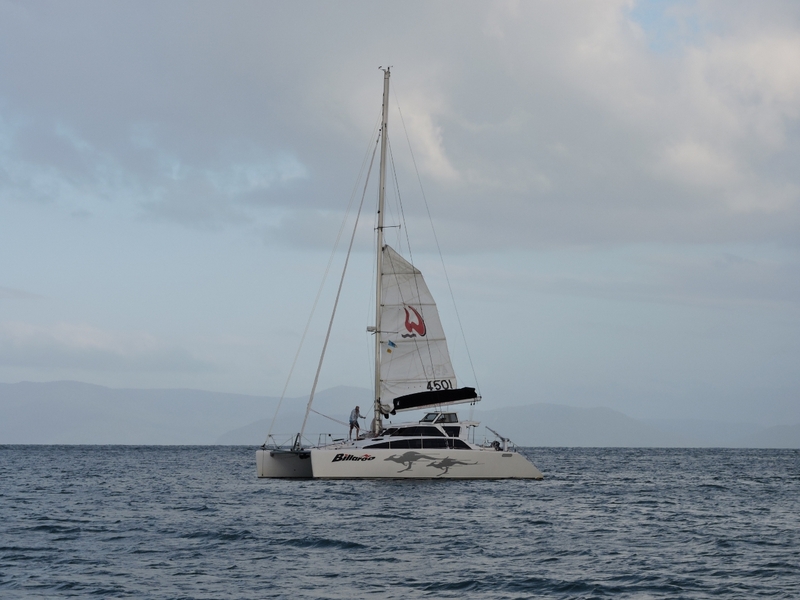 We did this partly because we were covering new territory, and also because we weren’t eager to get much farther north with Cyclone Solo having formed near New Caledonia just four days after we arrived at Shaw Island. The pilot house HVAC system still was not draining properly, although fortunately we didn’t soak the master stateroom again. Here we are pouring boiling water down the drain hose to clear any debris. A lot of debris came out, and we got the drain flowing well again. But when we plugged the bottom of the drain for a leak test and filled the drain base, we found water seeping under and discovered a crack in the base. 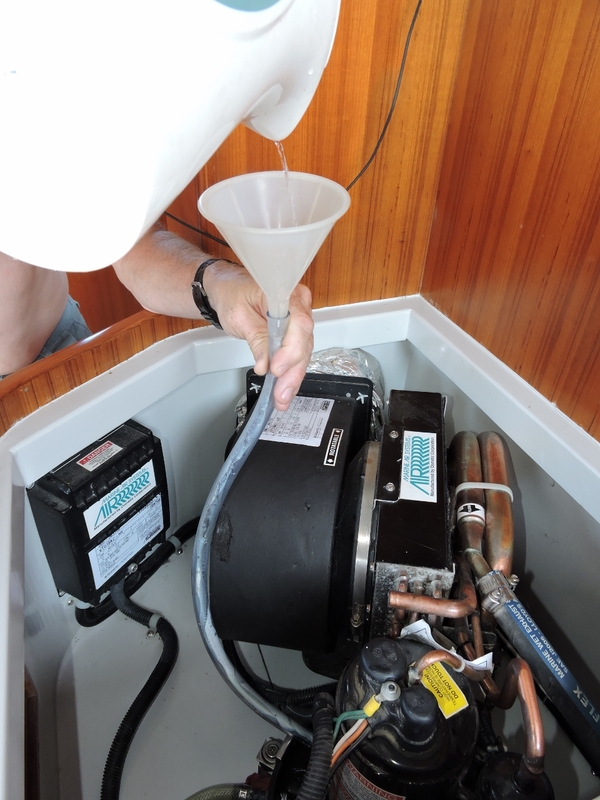 On inspecting our other HVAC systems in the salon, and the master and guest staterooms, we found that all had a single small crack radiating out from where the drain hose barb was installed. We fixed them with 5-minute epoxy. We’re anchored at Shaw Island pretty much where we were last time here. 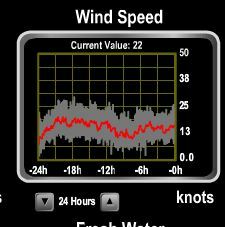 We’d left the Gold Coast a little earlier than expected to take advantage of light winds before they picked up from the SE yesteday morning. 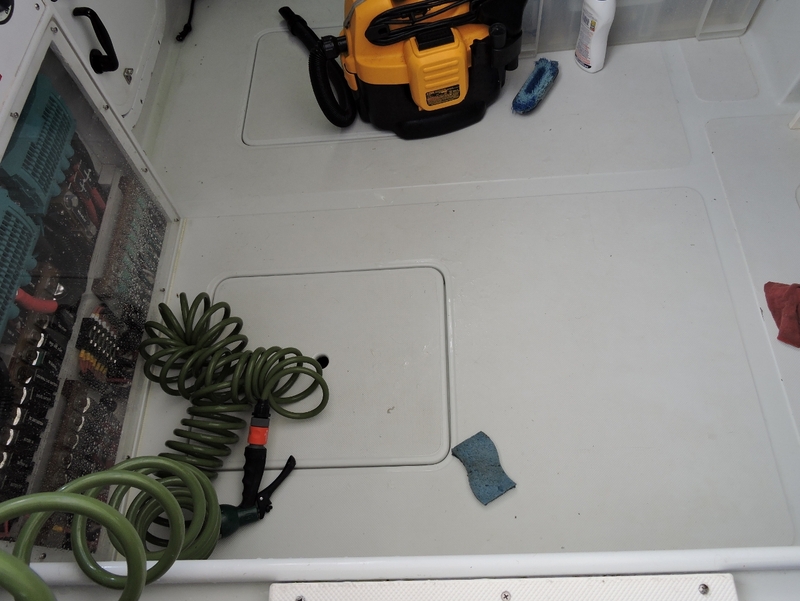 We still have a list of boat projects to complete, including stowing the rest of the pallet of gear that we picked up in the Gold Coast. So we’ll stay here for a few days and work them off. Spitfire reports that we’re back in tropical weather. 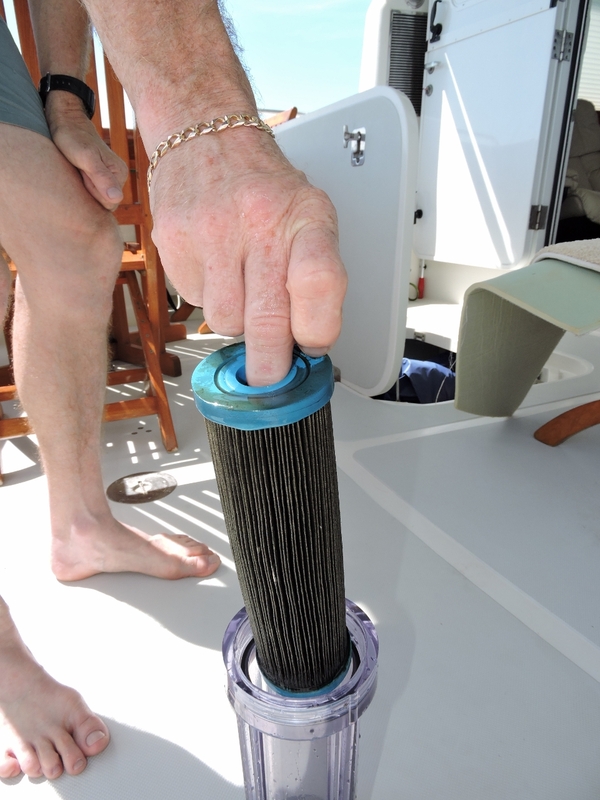 We have a sand-filter ahead of the watermaker intake that catches much of the debris, so we only schedule a change of the 5-micron watermaker pre-filter every 12 months. We’re not sure what got past the sand filter, but this one needed an early change and it smelled bad as well. 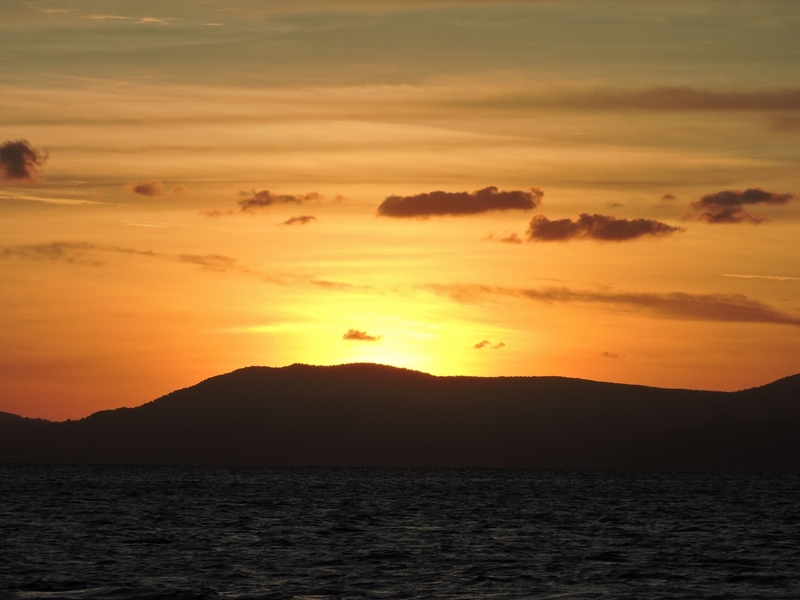 A beautiful sunset over the Conway Range on the Australian mainland. 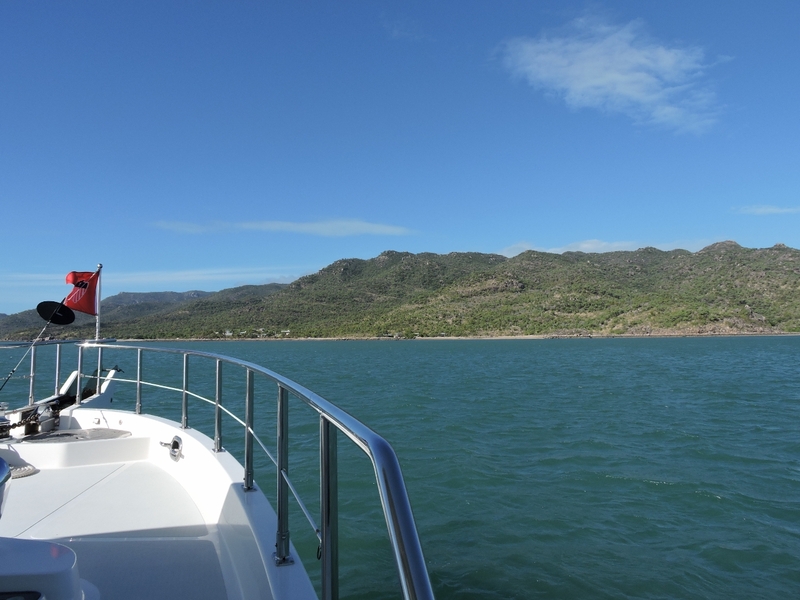 Fellow Seven Seas Cruising Association members Kerry and Sue Craig hoisting sail on Billaroo to return home to Mackay. They noticed our burgee and stopped by to chat for a bit yesterday. We’ll be working our way north over the next few weeks. We’re not in any rush with cyclones active not far north from here. 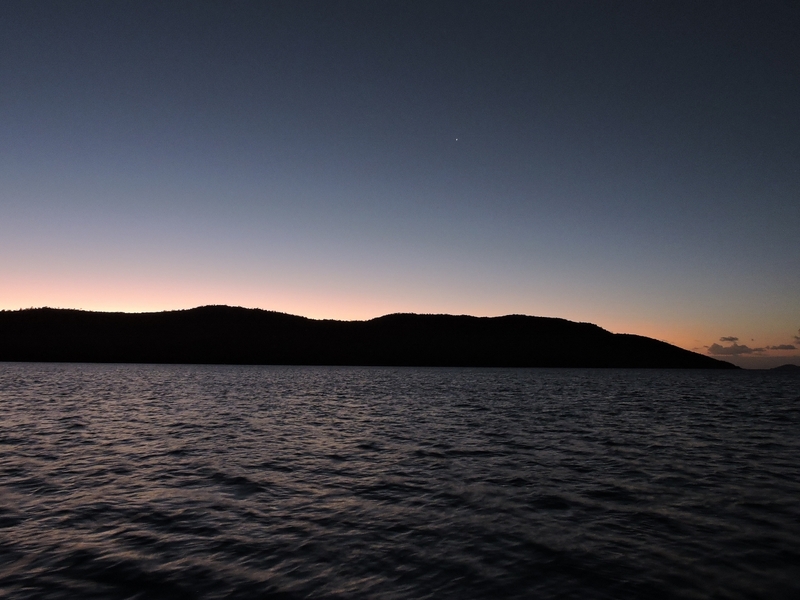 This is the view looking east from our current anchorage at Woodwark Bay. About once a year we scrub down the floors in the engine room and lazarette. 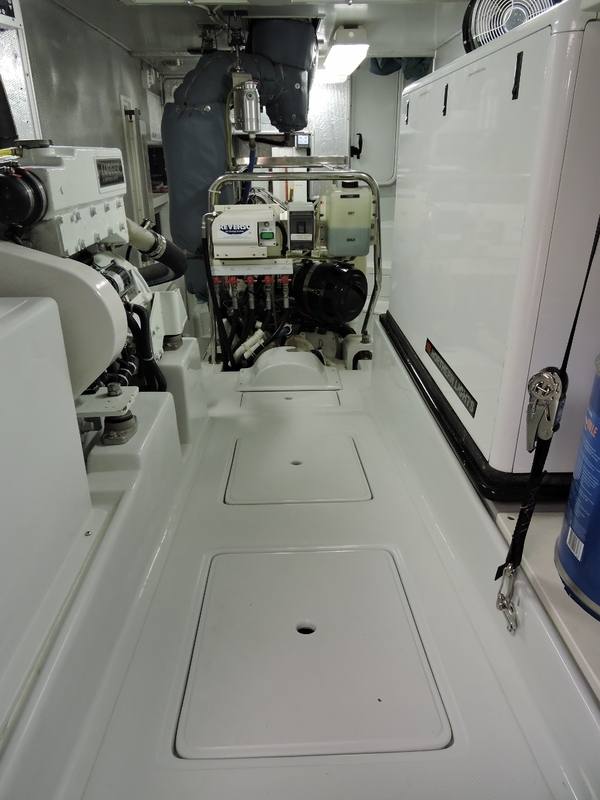 After a good scrub, the engine room is looking almost like new again. Spitfire subduing his catch–a small pipefish. 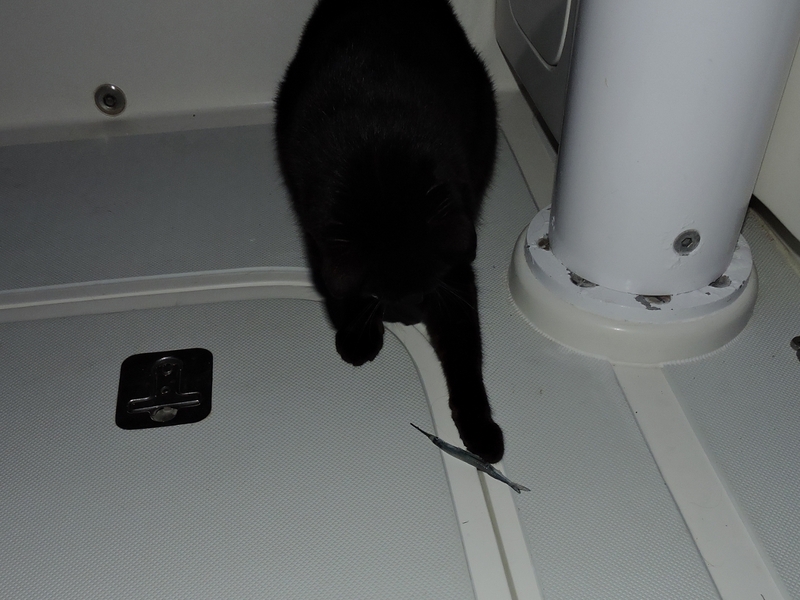 His fishing technique is to wait on the swim platform until a fish lands in front of him, bring it into the cockpit to get the fight out of it, and then eat it whole. He continues to reinforce his lead over everyone else on Dirona for fishes caught. 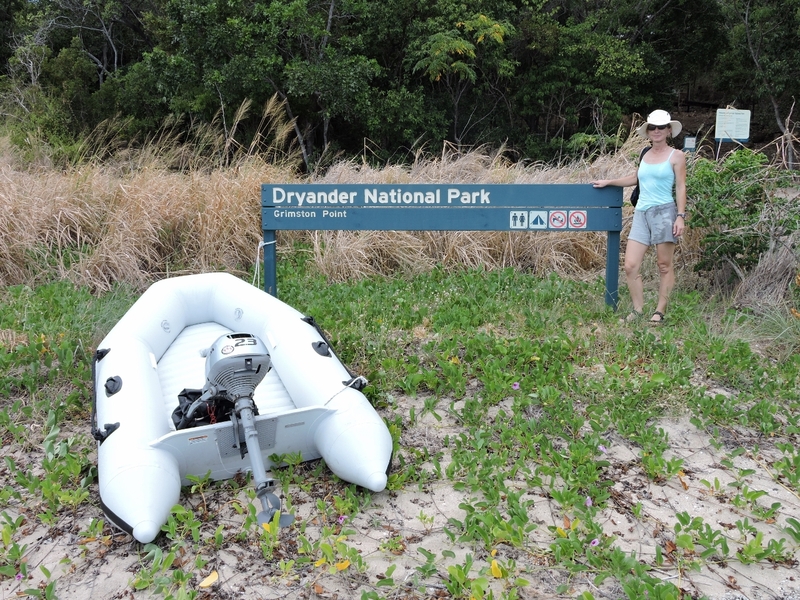 Ashore at Drynader National Park in our first test of the new micro-tender–it was just as easy to carry ashore as the smaller one. The park encompasses the shore on both sides of Woodwark Bay, and inland from Double Bay to our west. A small campsite is here at Woodwark Bay. Walking the soft-sand beach along the bay. 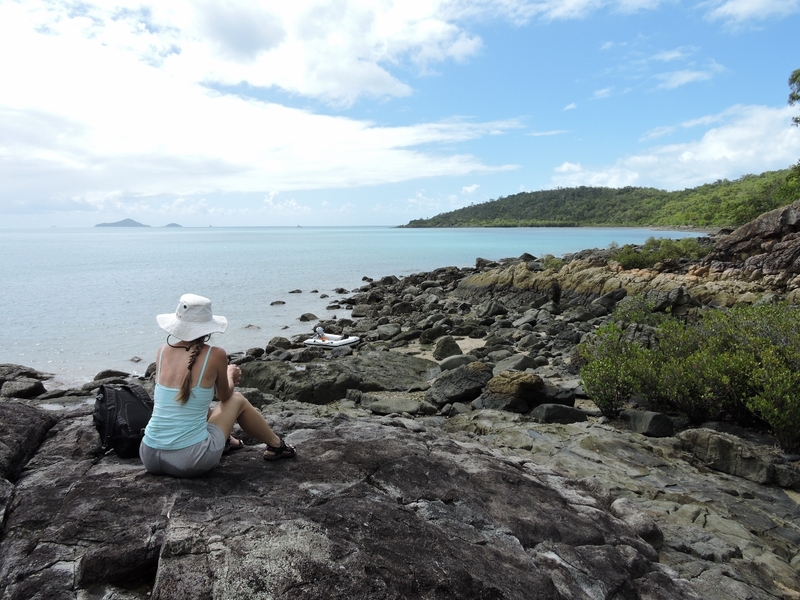 We hadn’t been ashore since the Gold Coast, so we particularly enjoyed the walk. The view looking southwest from the grassy slope behind the beach. We were planning to walk the short distance across the isthmus to have lunch on the other side. We found a trail, but it ran through thigh-high grass. We weren’t keen on the possibility of a poisonous snake encounter while wearing only sandals, so we kept the line moving. 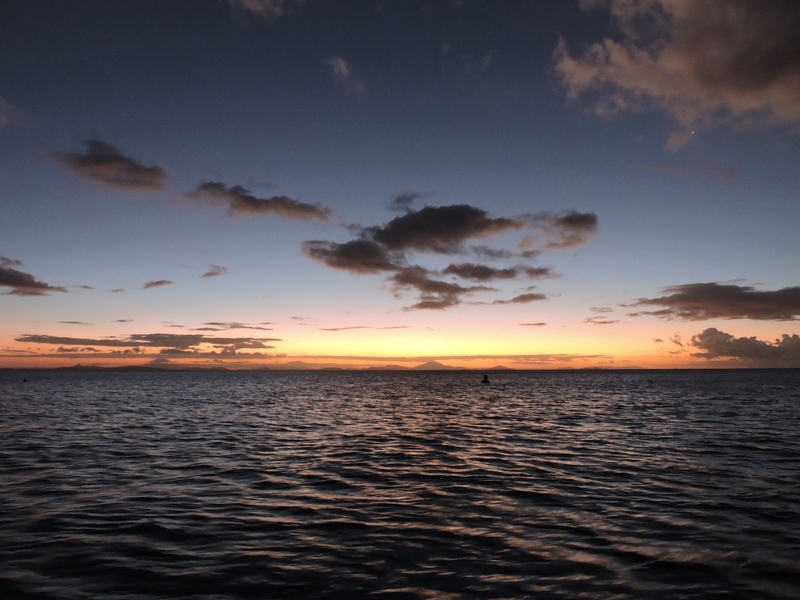 Looking northwest from the anchorage at dusk. We’re still adjusting to the high daytime temperatures, but evenings on the back deck with a cool tropical breeze are wonderful. 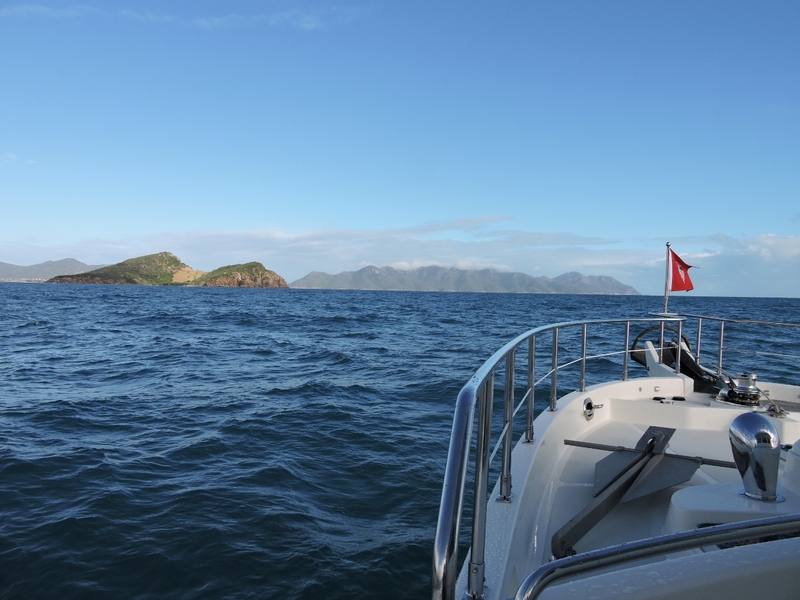 Approaching Saddleback Island, with hilly Gloucester Island in the distance. 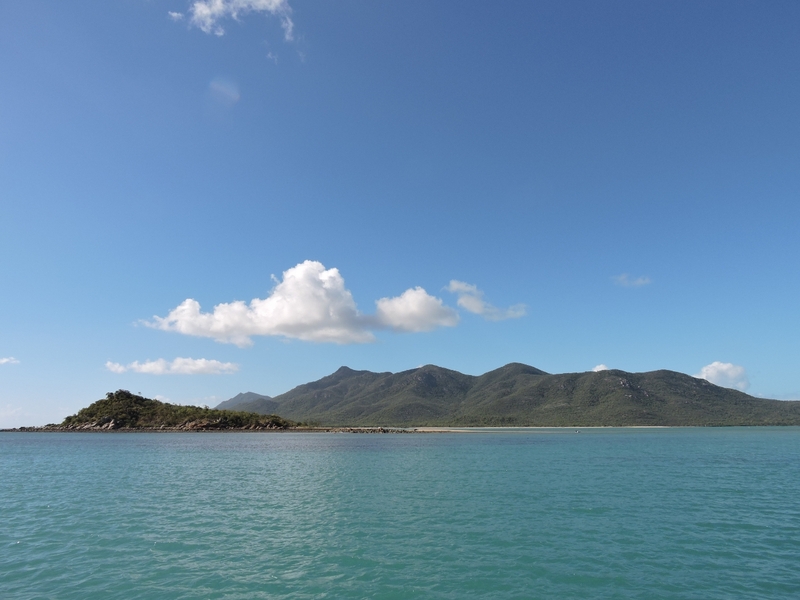 Shortly after we rounded Saddleback Island, a squall came through and all but the southern tip of Gloucester Island disappeared in the precipitation. Looking north from the anchorage across Shag Islet to Gloucester Island. Tiny Shag Islet is home to the Shag Islet Cruising Yacht Club, a virtual yacht club where a nominal fee gives a lifetime membership, and everyone is a Vice Commodore. Once a year, the club has a rendezvous at Shag Island. 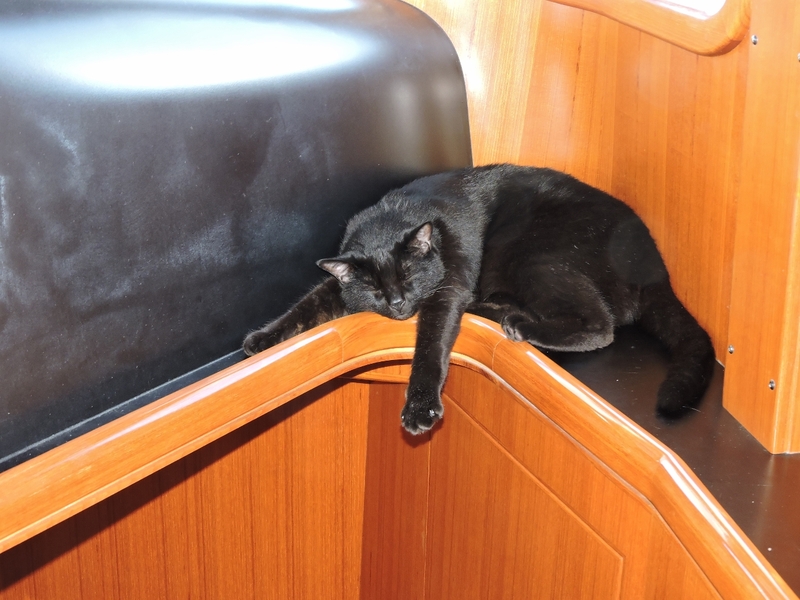 In 2013, they drew 180 boats and 1,400 attendees. 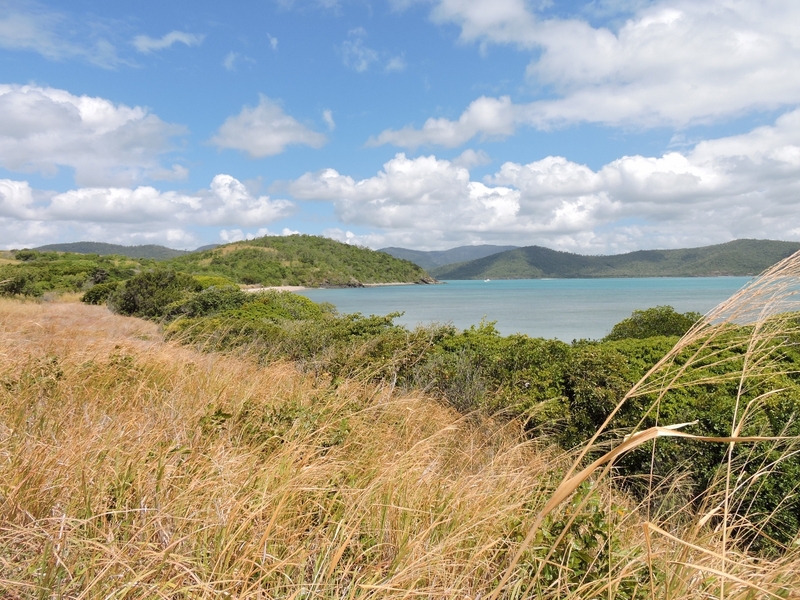 The view west across Edgecombe Bay towards Bowen at dusk. In the prevailing southeasterly winds, the anchorage is calm and sheltered. 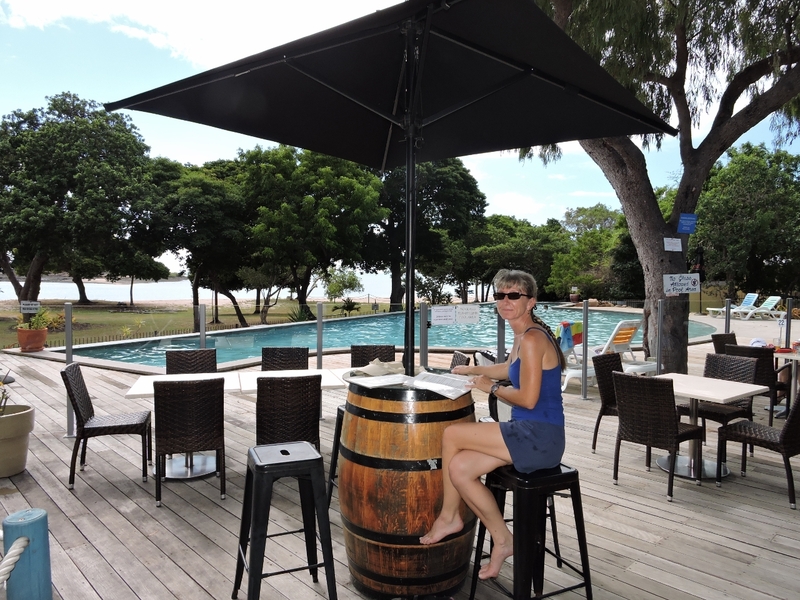 We had a great meal poolside, with a view to the beach and bay, at the Oar Bistro in the Cape Gloucester Beach Resort. 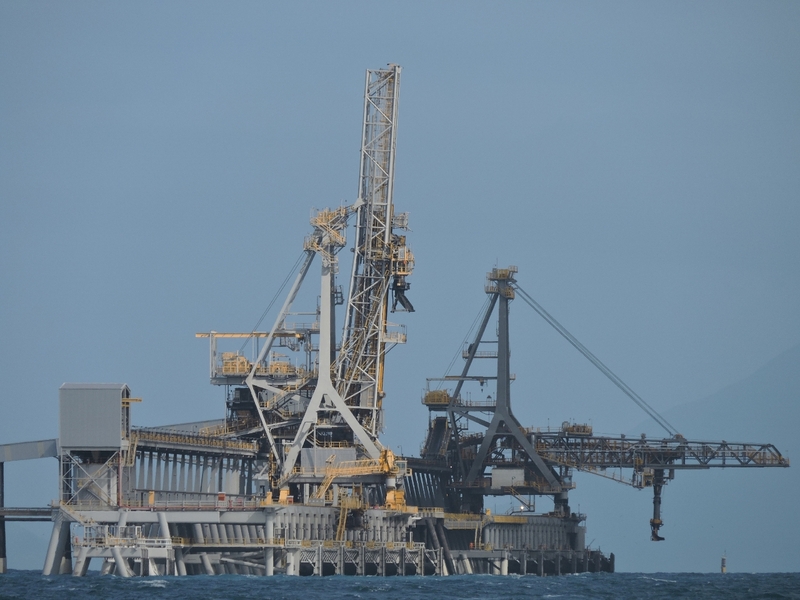 This massive offshore loading facility serves the Collinsville Coal mine, about 55 miles inland from Bowen. The mine produces about 6 million tons of coal per year. 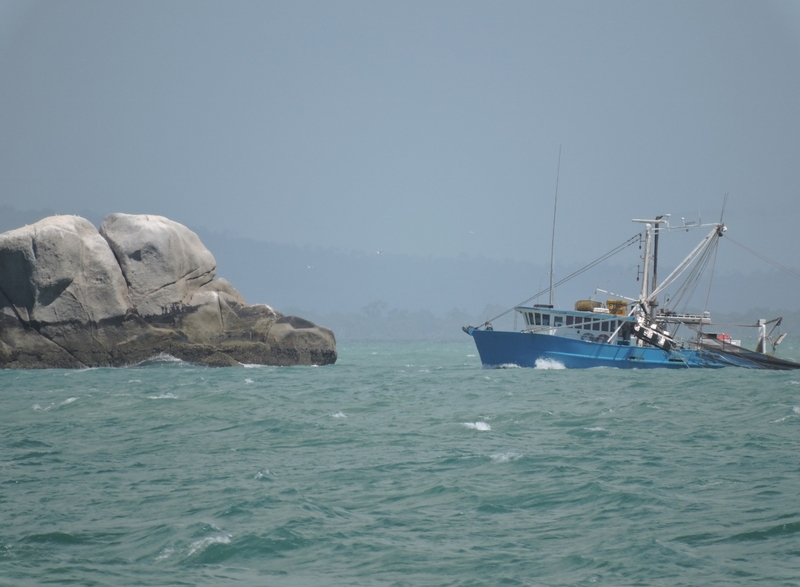 A fishing vessel working near The Bun–a small rock off Cape Upstart. Upstart Bay was much larger and more open than we were expecting, with shallows a long way off shore. 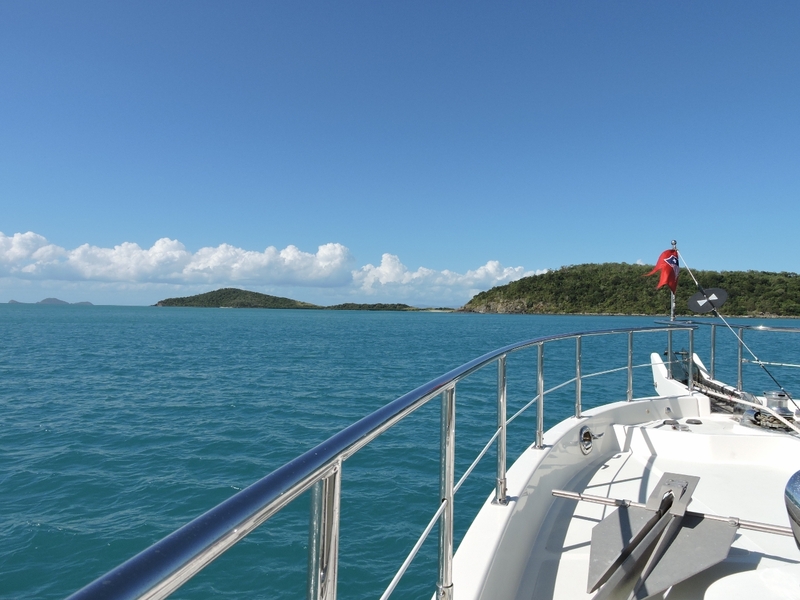 We did find a decent anchorage about halfway in with protection from the swell and the prevailing southeast trade winds. This is the view looking east to Cape Upstart. Love watching the progress you are making… I wish I were motoring about the world…I will be just 10 years behind you. Great post on electronic charts. Moreover, the business details of your biggest machine (AWS) were revealed to much fascination. Congrats! Fair sailing and a following sea! Thanks for the feedback on the blog Matt. On the AWS financial numbers released this quarter, your right that did catch some attention. It’s a sizable business already but it’s still very early days in cloud computing. It’s hard to predict what will happen over even the next year but it’s super clear the industry is going to continue to show startling growth for at least the next 10+ years. As big as it is already, it’s just getting started. Good luck on your plans to do a similar trip in 10 years. You’ll find the hardest part will be deciding when to prioritize the trip above everything else you are doing and making it happen. It’s actually a difficult decision. All the best.